Falafel filled with tehina, Popcorn in a box, watermelon juice, tequila in painted skull bottles, sangria in a box, squeezable hummus and a special cover for challah dough. 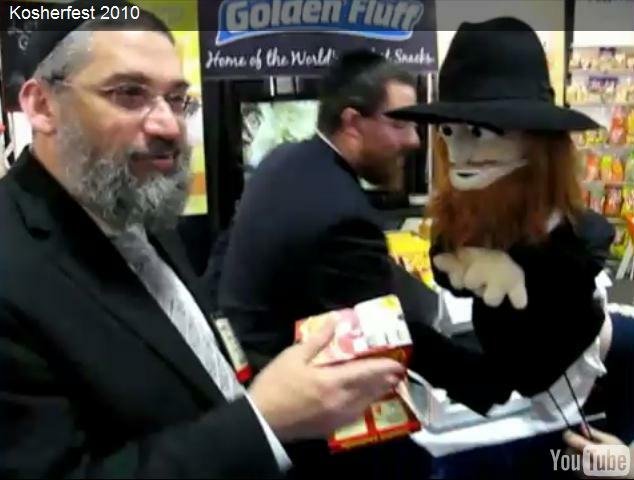 These are some of the prize winning and unusual products on display yesterday and today for the thousands of visitors representing all aspects of the food industry at Kosherfest 2010 at the Meadowlands Exposition Center in Secaucus, New Jersey. More than 300 exhibitors lining both sides of seven aisles are vying for the attention of visitors (trade only -- but kiddush ladies seem to be an accepted subset) who try to manage noshing and stuffing literature into the bags provided by some vendors. And there's plenty to nosh and to stuff. If you love kiddush, have a few hours to spare and don't mind walking half a mile to a parking lot, this is the place for you. It's still open all day today, Wednesday, from 10 am to 4 pm. The on-site registration fee is $60. It's sad that you don't show the best booth. "belgian crêpes " and "Benisti/Codron" chocolat.